makes your skin strong and pretty good. As always, contributions of better translations in the comments are very, very welcome! I recommend this institute to you. very strong and they spank pretty good. Well the translation don’t make it. Because your tongue is nasty/spiteful, I recommend this institute. Service(staff) is very reliable, very powerful and beat (spank) quite well. Trashing (or spanking) Institute for gossip addicts. “Klatsch” is a German word used mainly for women, who tell everything (the thing) she has heard or seen from somebody to everybody who’s willing to listen to them. 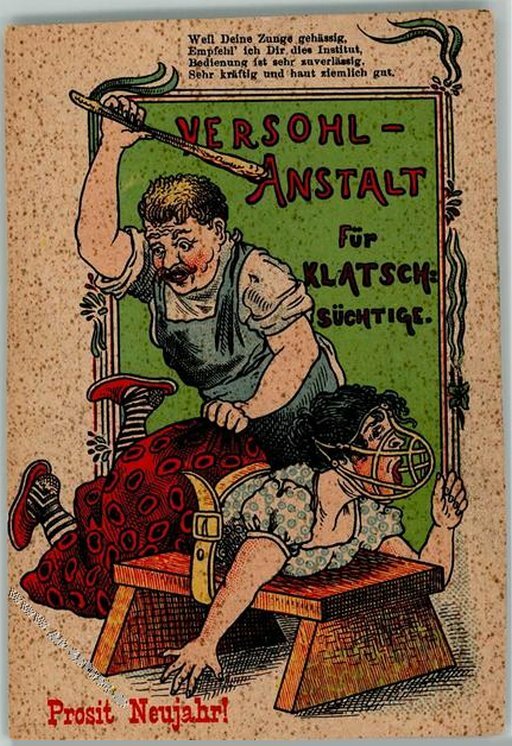 Klasch must have been quite popular until 40’s year ago but was not very welcome to many men. Bytheway Google translate is not the best choice any longer try http://www.deepl.com. With this “poem” it has its problem too, because of the omissions. Weil deine Zunge gehässig _ist_, empfehl_e_ ich dir dieses Institut. Bedienung ist sehr zuverlässig, sehr kräftig und haut ziemlich gut. Very strong and hits really well. There’s a lot of German heritage in the part of the US I come from, Spankblog Reader; and the housewives there have a phrase “Coffee Klatsch” which literally means a social gathering to get together and gossip over coffee. So gossip isn’t very far off the mark! “Institute” in English has never any connotation except the most stuffy and scientific; we would always use “institution” (like “mental institution”) for a house of correction of this sort. So I incorrectly took it in the other sense of a practice or tradition. I recommend to you this institution. They are strong and they spank hard! Well yeah but can we make it rhyme as I assume it does in the original? This institution is for you. They’re strong and spank hard, too! Maybe rhyme it like that? so in this institution you belong. they’re very strong and hit really well.